Lexus Team Keeper Tom's used number 1 for the next season but its is the first time to used 37 TOM'S car to used champion number . For GT300 champion, Goodsmile Racing used number 0 car again for AMG GT3 . As the calendar for the SUPER GT is slightly changed due to the replacement of Suzuka 1000km race to Fuji 500 mile race . But it doesn't look too bad for me. 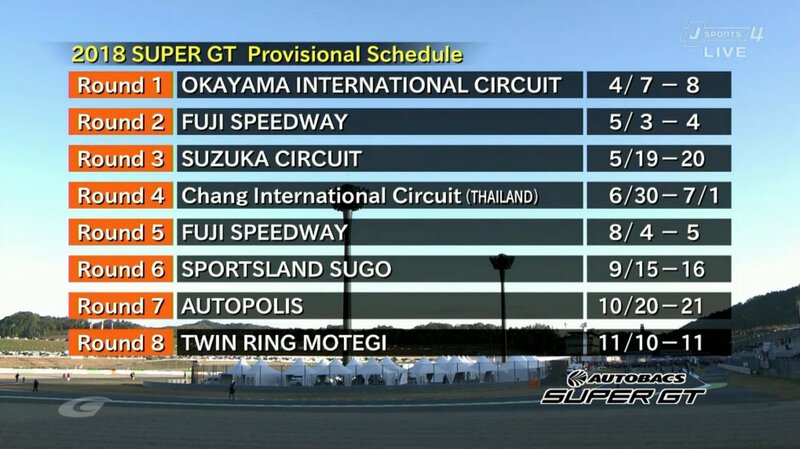 And here is the timetable for the 2018 season of SUPER GT. Off-season just means FESTIVAL SEASON!!! Team Studie BOB Suzuki seems to think there is a cause of the Team's slump in the tire. They might switch the tire brand next season. 2017 Super GT season has ended. I would like to express my gratitude to you from the bottom of my heart for your support. It is 10 seasons since we had participated in Super GT. And it is seventh season this year since we became an entrant team. We ranked 13th as team ranking higher than 1 position than last year. We cleared the minimum goal as A seeded keeping, but we are not the team we made for such a purpose. We left away from team GSR since 2014. When I started up this team with BMW Japan, I gathered drivers, engineers, mechanics, tire manufacturers and other staff to create a team involved in the championship constantly. However, for the past two years we were forced to fight hard and painful race. Speaking for this year, we were even impossible to climb the podium. Even if we challenge next year with the same structure, I don't know whether there is a bright future there. However, countermeasures against the cause of the main cause can not be seen. Of course, there are problems on the machine side as well as for us dealing with it. However, in the current Super GT, we can not expect good results unless this problem (=tire) can not be cleared. The final race yesterday was exactly the race that it was exposed. In a sense, it was a race that symbolized this season. After Thailand's race I was able to imagine the image for next year, but now I can not do it at all. I'm still not in a mental status that I can write blogs, but I'd like to say this to you. Anyway, I really appreciate your support. I could not deliver sensation to you, I'm really sorry. A rabbit had run at Motegi racing course in 1st lap. Kazuya Oshima (#6) had a bad luck yesterday. A bicycle of ignoring a red signale crashed into his car (Lexus RX). Judging from Toyota Gazoo Racing Festival's car line-up, #36 and #19 will be sended to Malaysia for annual Christmas Sepang test. What tire do you think the Studie team will switch to? Bridgestone? The comparation between identical cars with different tyres (M6 GT3, RC F GT3 & AMG GT3) were quite clear. But in this case, #4 GSR Hatsune Miku is the exception. Last edited by hvr777; 14 Nov 2017 at 01:52. But I don't think they will switch Bridgestone as ARTA is using Bridgestone with M6 GT3 , unless they changed to NSX GT3. Then Michelin is the good choice for Team Studie , that because team Studie is one of the official BMW team. And there only nine official bmw teams in the world . Therefore, most of the official bmw team use Michelin tires. And Michelin tires have significant improved for the last time , as MOTUL GT-R proved that it's strong , and Michelin will not hesitate to supply GT300 team . The last seen in GT300 using Michelin since 2014 for Subaru BR-Z GT300. For Dunlop it doesn't make sense , that because Dunlop tires are Same tires competitiveness as Yokohama. Speaking about the other tires brand outside Super GT . I think it's unlikely to use all of the other brand of the tires , except Pirelli. But Pirelli tires it's only supplies the race as the sole tires supplier only but not multi tires supplier. As Pirelli oppose to participate as the tires supplier as one the multi tires supplier just like F1 and Blancpain gt series. Last edited by AkioAsakura95; 14 Nov 2017 at 01:50. Kazuho Takahashi says to jp.motorsport.com that Team Cars Tokai (#2) will introduce brand new chassis next season. It means that Cars Tokai will use NSX GT3 for the next season right? It might mean just replacing monocoque of Evora. Karthikeyan might join in Sepang test? Keiichi Tsuchiya (ARTA,#55) tweets that NSX GT3 won't be delivered to ARTA next season. That's great man!!!!! They might be one of the BMW customer team as well. In addtional , do you aware that BMW dealership in ARTA is changed to Ikekuburo BMW to Tochigi BMW for the last round of SUPER GT? Last edited by AkioAsakura95; 14 Nov 2017 at 10:36.